A statement from those who study, research, educate, and write about women, women’s issues, women’s history etc. On Tuesday, November 8, 2016, a sizeable minority of the U.S. electorate chose to send billionaire Donald Trump, an avowed sexist and an unrepentant racist, who has spent nearly forty years antagonizing vulnerable people, to the White House. Spewing hatred at women, people of color, immigrants, Muslims, and those with disabilities is Trump’s most consistent, and well-documented form of public engagement. Trump bragged about sexually assaulting women because, as he quipped, his celebrity made it easy for him to do so. We can only assume that the hostile climate and anxiety about what is to come were contributing factors. The political shift we are witnessing, including the appointment of open bigots to the president-elect’s cabinet, reaffirms the structural disposability and systemic disregard for every person who is not white, male, straight, cisgender, able-bodied, and middle or upper class. As a community of feminist scholars, activists and artists, we affirm that the time to act is now. We cannot endure four years of a Trump presidency without a plan. We must protect reproductive justice, fight for Black lives, defend the rights of LGBTQIA people, disrupt the displacement of indigenous people and the stealing of their resources, advocate and provide safe havens for the undocumented, stridently reject Islamophobia, and oppose the acceleration of neoliberal policies that divert resources to the top 1% and abandon those at the bottom of the economic hierarchy. We must also denounce militarization at home and abroad, and climate change denial that threatens to destroy the entire planet. We must also reject calls to compromise, to understand, or to collaborate. We cannot and will not comply. Our number one priority is to resist. We must resist the instantiation of autocracy. We must resist this perversion of democracy. We must refuse spin and challenge any narratives that seek to call this moment “democracy at work.” This is not democracy; this is the rise of a 21st century U.S. version of fascism. We must name it, so we can both confront and defeat it. The most vulnerable, both here and abroad, cannot afford for us to equivocate or remain silent. The threats posed by settler colonialism and empire around the globe have never been more real, nor has our resolve to oppose these injustices ever been stronger. Concretely, within the U.S., we oppose the building of a wall along the U.S. – Mexico border, and the establishment of a registry for Muslim residents. We owe this moment and the communities we fight for our very best thinking, teaching, and organizing. We must find creative solutions to address the immediate needs of those who will be acutely affected within the first 100 days of Trump’s presidency. We must push ourselves into new, and more precise and radical analytical frameworks that can help us to articulate the stakes of this moment. The most important thing we can do in this moment is to make an unqualified commitment to those on the margins through our actions, insist that the media be allowed to do its job; and protect the right to protest and dissent. We recognize clearly that our silence will not protect us. Silence, in the aftermath of 11/8 is not merely a lack of words; it is a profound inertia of liberatory thought and praxis. So – what are we waiting for? We are who we are waiting for. 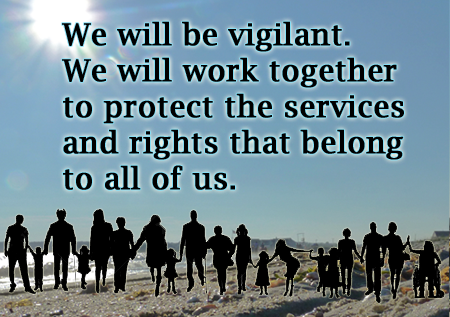 We pledge to stand and fight, with fierce resolve, for the values and principles we believe in and the people we love.